CHEESEY CHIPS: Jasper Stancombe, Ben Maguire and Will Bohnke are mad about cartoons. 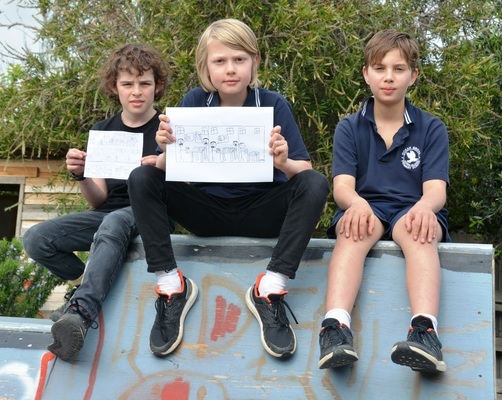 Three Ocean Grove Primary School students are just crazy about cartoons. Ben Maguire, Jasper Stancombe and Will Bohnke are three close friends who spend most of their spare time creating their own cartoons. The Grade 4 students come up with their own ideas and call themselves the Cheesy Chips. “We were at Ben’s house eating cheesy chips and that’s how we came up with the name,” Jasper said. A far cry from computer games and watching TV, the trio prefers to create and develop their own ideas onto paper. “We all like drawing and every time we get to do creative writing at school, we do comics,” Jasper said. “Every Friday we go someone’s house and work on our ideas for two hours,” Ben said. The boys were inspired by the Amulet range of comic books, but enjoy old favourites, such as Peanuts. “We all come up with the ideas,” Ben said. “We do like to do it together,” Will said. All the boys enjoy maths at school. “It’s kind of like learning a different language because it’s all numbers,” Jasper said.